As industrial equipment require frequent maintenance to keep it optimum, maintaining the environment inside an industrial area is very much essential too. Excess humidity in the industrial area creates a negative impact and directly damages the industrial items and expensive equipment. It is very much necessary to maintain the humidity content to keep the equipment working in good condition and failure to maintain or control the humidity content would cost the company. Industrial dehumidifiers are equipment to extract moisture content from air to reduce the humidity of air in industrial environments. 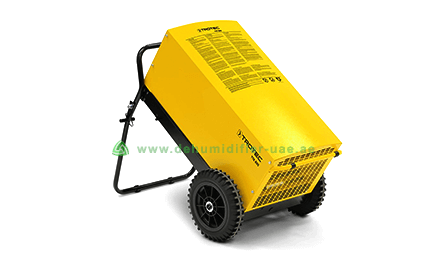 Vacker supplies all types of Industrial Dehumidifiers in Dubai , Abudhabi and other emirates of UAE. Humidity is the amount of water vapor in the air. Too much humidity in the industrial areas will lower the performance of equipment and reduce its durability. It will also create health issues among the workers employed in that area such as dizziness, fatigue and so on. How to reduce humidity in Industrial Environments? The high humidity that affects the industrial environment can be controlled. There is a solution to control the humidity content, it can easily be reduced with a device known as “Dehumidifier”. A Dehumidifier controls all the moisture content in the air and emanates dry air. With this process, the environment around the area will be healthy and comfortable and also increases the performance of workers and durability of the industrial equipment. Industrial spaces are usually large and hence, controlling humidity in industrial areas would require dehumidifiers with large capacity. Dehumidifiers of large capacity have high dehumidification performance. Such devices extract high moisture content from the air and keep it moisture-free. Hence, it is better to choose a dehumidifier with great dehumidification capacity for large spaces. TTK 800 is a high-performance dehumidifier designed with advanced technology, reliability and great dehumidifying capacity. This device is designed with tough material and is suitable for construction and industrial applications. The combination of 3 great features such as High Pressure Radial Fan, Strong Rotary Compressor and Air Flow Lamellae, makes this device one of the best Industrial Dehumidifier. The dehumidification capacity of Dehumidifier TTK 800E is maximum of 150 Liters for every 24 hours. It performs well even below 15 °C. Perfectly suitable for room size up to 800 meter cube. It has large wheels for easy moving. The device features operation hour counter. Industrial Dryer DH 150 BX ES is an Industrial Dehumidifier with a very high dehumidifying performance. It has neat and impressive design built with stainless steel structure. Due to a dehumidifying performance of maximum of 300 Liters every day, this dehumidifier is rightly suitable for various industrial applications like Manufacturing, Food Storage, Industrial Process and so on. This dehumidifier conveniently reduces the humidity content in large areas and keeps the environment moisture-free. This smart industrial dehumidifier is equipped with condensed water pump. Great stainless steel design and easy maintenance. It is integrated with a Hygrostat. Dehumidification performance of up to 300 Liters/24 hours. The operating range of this Industrial Dehumidifier is 0-40°C. The Industrial Dehumidifier in UAE are supplied by Vacker UAE in Middle East. Vacker UAE is a Pioneer Dehumidifier provider in Middle East and has been top rated in customer satisfaction.